Reliable Low Priced Boat Delivery Anywhere In the U.S.
We are a fully licensed, registered and insured boat transport company with over 25 years of experience shipping vessels throughout the U.S. Every boat we ship is covered by insurance, moved by a licensed professional, and tracked in real time with satellite technology to give our customers live updates on the status of their boat while it’s being delivered. Whether you need your boat transported with a cradle or trailer, we have an affordable solution that will work for you! Fill out our online quote calculator to see how affordable it is to have your boat transported! 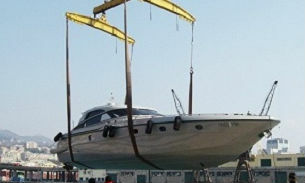 We also offer free consultations over the phone with one of our boat shipping specialists. Even if you’re not having your boat shipped that far, it’s extremely important to secure anything that might shift, open or detach while being moved. Things that should be safely stored include antennas, propellers, dinghies, flagstaffs and outriggers. If you have any questions about what should be stored, please call us to speak to one of our staff. This one is a biggie! If you’re having your boat moved from one state to another, the presence of zebra mussels could potentially cause your boat to be impounded. Obviously the size or your boat will affect the type of carrier used to transport it, so it’s very important that you have accurate measurements when you speak to a professional boat moving company. Before turning your boat over to a professional boat moving company, it’s important that you document any existing damage, which the driver of the carrier will also do. It’s a good idea to be thorough, take pictures and keep records so you can make sure your boat arrives in the same condition in which it left. Don’t hesitate to call us if you have questions about shipping your boat! Our consultants are among the best in the business and we also offer free quotes with no obligation on your part! Use the free quote form to start saving today! State Boating Laws – From the National Association of State Boating Law Administration (NASBLA), information on state boating laws and safety. Boating Safety – A state-by-state breakdown of boating laws, safety and education materials. U.S. Coast Guard – Boating safety, news and information directly from the United States Coast Guard.